As you step into the quiet, cool interior of the shrine, it's as if you are a time traveler, and the world has stopped to pay respects. There is a weight to the atmosphere, as if the spirits of those men remain within the stone of the walls. And maybe they still are. The name of this place is never by itself, not when referencing this sacred space. Just saying the name "The Alamo" calls up a feeling of reverence for those who were born in Texas. It is a part and parcel of who we were, and who we are. Founded around 1724, the Mission San Antonio De Valero was originally a religious community, when Spain was attempting to create an empire. After that, the mission became a variety of things, including a garrison for soldiers. Somewhere along there, it became known as the Alamo. And on March 6, 1836, it became a shrine dedicated in the blood of those who died there. Men from many different countries, Mexico too, and a well-known individual named David Crockett. There are differing accounts regarding Crockett's death, but all of the soldiers who fought the Mexican Army that day were killed in a battle lasting about 90 minutes. 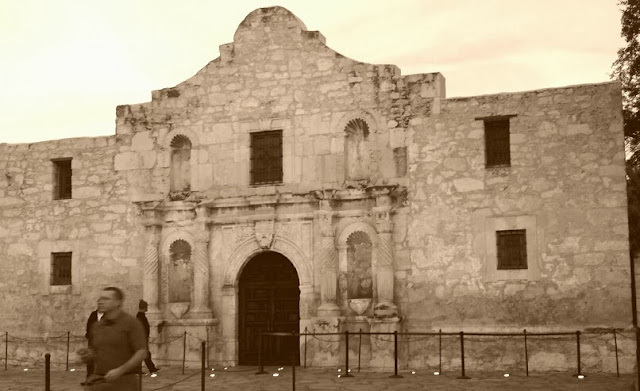 The Alamo wasn't considered to be that important before the battle. Not important enough to send reinforcements, anyway. And yet, the Battle of the Alamo helped galvanize the fledgling government of the Republic of Texas, and made it possible for Sam Houston to rally his own forces and defeat Mexico. Out of the ashes of defeat, victory. Texas became an independent republic. I don't know if I would be able to do what those men did. To stay and fight, knowing that there was only one possible outcome? I'm not that kind of brave. My sense of self-preservation is strong, and I would want to flee, to fight another day. But they stayed, and they died, and we remember and honor them to this day, just like we try to honor all of those who gave up their lives in service to their country. It's sad but true that a lot of places are only well known because of the tragic battles that occurred there. I'm like you, I don't think I could stand and fight. I have the utmost respect for every man and woman who trains to be a soldier to defend their country and others. Thanks for the thought provoking post. I could not fight in most of the battles that we have nowadays. The only way that I could fight in a war is if I really believed in the cause AND all my familial responsibilities were being taken care of. My oldest son is training as a combat engineer and I am very proud of him. My mother is headed there later this week! Tell her to watch out--the margaritas are stronger than they look!